"Sampath Speaking" - the thoughts of an Insurer from Thiruvallikkeni: white tiger in Transit (in passenger plane) ... !! white tiger in Transit (in passenger plane) ... !! Every travel is an experience ~ there is no parallel to a travel by train – wherein you can enjoy the outer environment, thy neighbours, intermediary halts and more… when you fly by air, often the few hours would be spent in monotony and most likely thy neighbour would not even recognize your presence …….. but think of this weird co-passenger !!! Rama, Chandra, Veera, Sembian, India, Valli …. if you are wondering what these names are ... these are tigers (some are white tigers) at Vandalur…. .. a couple of days ago, our Chief Minister J Jayalalithaa took named three new borns at the Vandalur Zoo. She named the male white tiger cub Rama, its female sibling Chandra and a male lion cub Veera. Presently, Vandalur zoo has 18 tigers, including 10 white ones. Of the over 230 zoos in the country, Vandalur is among the few to have white tigers, and to have bred them successfully in captivity. Though there are specialised non institute clauses for providing coverage to livestock, no standard form is available for animals in transit and coverage thoughtlessly on Institute cargo clauses (All risks) could be an invite to disaster. The Insurer need to analyse the proposal and understand the various requirements including feed and watering as also accompaniment of veterinarian during the transit (if required). 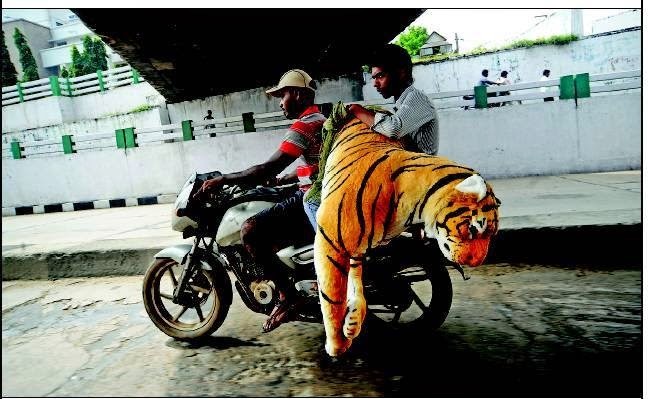 At a time when the tiger population (Royal Bengal Tigers and white tigers) are on the increase in Vandalur, read about this transportation of a Tiger from Delhi to Thiruvananthapuram. TOI reports that the uncertainty over the transfer of a white tiger from the National Zoological Park (NZP), Delhi to the Thiruvananthapuram Zoo has been cleared with the Delhi zoo officials reaching an agreement with Air India (AI) regarding the transit of the big cat. As per the latest plan, the beast will be flown to Thiruvananthapuram from Delhi in the cargo hold of an AI passenger aircraft. Earlier, it was planned to bring the animal in a cargo carrier. “However, we couldn’t find any direct cargo flights connecting Thiruvananthapuram and Delhi. The other option was to bring the tiger in a cargo flight to Chennai and then transport it to Thiruvananthapuram by road. This would have resulted in stress to the animal. Hence, the move to opt for a passenger aircraft,” said NZP veterinary doctor Dr Paneerselvam. According to Delhi zoo officials, AI authorities have been directed to prepare a special crate for the white tiger. “We are ready with the cage. It will be inspected to ensure that it suits the norms and after that the date and time of the flight will be fixed,” the vet said. The white tiger is being brought to the city zoo as part of an exchange programme under which the NZP will get a jaguar as a breeding loan. As per the DGCA aircraft rule 24-C, wild animals may be carried only in the cargo holds of aircraft carrying passengers provided that there is no direct access to the passengers’ compartments. The animal will be confined in a container, which would prevent the animal escaping and from inflicting injury on any person.